The Naval Academy in Annapolis is playing host to a first-of-its-kind science fiction convention this month. It's not Comic-Con...it's NavyCon. Did you ever notice that popular books and movies set in space always seem to feature navies flying their starships with fleets, commanders and admirals, instead of armies or air forces flying the starships? The folks at the USNA Museum paid attention—so they dreamed up a gathering of experts to explore how Navy forces are portrayed in science fiction versus reality. Claude Berube is the director of the museum, and has recruited 13 different naval experts and analysts to look at some of science fiction's most popular works. NavyCon will cover the various Star Trek series' made over the years: Star Wars, Battleship Galactica, Starship Troopers, and past and present video games. The diverse group of speakers includes former NASA astronaut and USNA graduate, Capt. Kay Hire, on the future of NASA, U.S. Congressman and former Marine Mike Gallagher, and the best-selling author of the Honor Harrington science-fiction book series, David Weber. 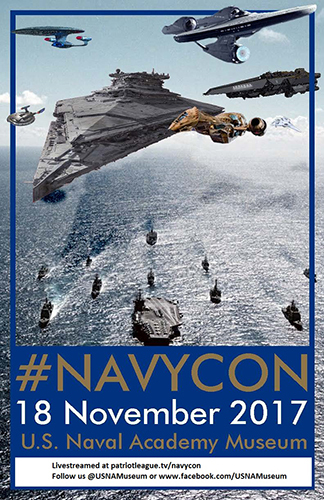 The half-day convention takes place Saturday November 18, from 12-5 p.m. NavyCon is for ticket holders only, and those tickets have already been distributed to USNA midshipmen, staff, and guests. But the museum will be live-streaming all of the speakers. Click here for the live stream, when the event begins.